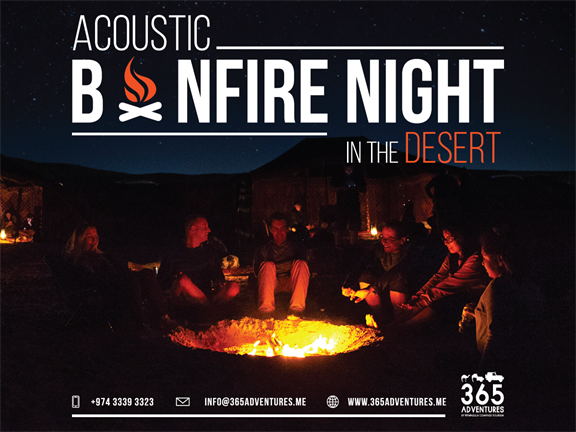 Sing your heart out under the starry night sky, bundled around the bonfire at this harmonious Acoustic night in the desert along with your loved ones and a guitar. Let's make some memories and jams that will last a lifetime! Start the day with a Desert Safari adventure, Inland Sea visit, dinner in the Resort and end the night with some acoustic tunes. All for QAR 250. - Pick up and drop-off facility from Doha by professional off road drivers (Hardee's, Old Airport Street). Group of 6 adults gets a car to their desired location within Doha. - Bring Winter clothes! It cold in the desert!